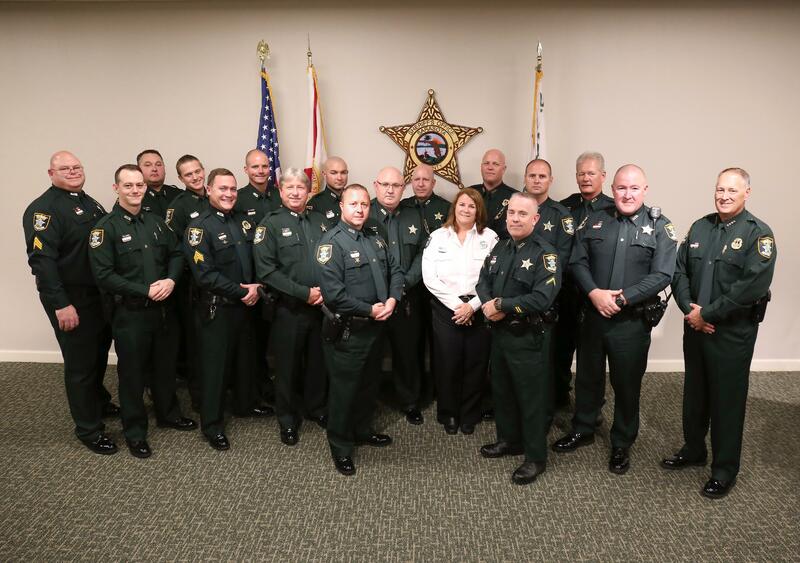 Sergeant Mitchell, Deputy Conly, Sergeant Kinney, Deputy Carpenter, Sergeant Sherman, Deputy Collison, Deputy Manley, Deputy Jackson, Deputy Ivanov, Deputy Major, Deputy Nault, Administrative Assistant Mary Lang, Sergeant Flint, Deputy Egan, Deputy Klinge, Deputy Micheel, Deputy Macnicol, and Sheriff Knight. Sheriff Tom Knight presented several awards during a ceremony Wednesday to recognize employees who demonstrated exemplary service to their community. Deputies Leo Egan and David Micheel received the Life Saving Award for their efforts in saving the life of a man who accidentally shot himself. On September 29, 2018, deputies responded to a residence where the victim called 911 to report he accidentally shot himself in the lower leg. After gaining access by jumping over a fence, Deputy Egan found the victim bleeding heavily from his injury and quickly applied a tourniquet. Deputy Micheel held the tourniquet while Deputy Egan continued to assess the victim until paramedics arrived and transported him to the hospital. The quick reaction and assessment by Deputy Egan and Deputy Micheel resulted in the preservation of the man’s life. Sergeant Charles Flint and Deputies Alexander Conly, Clayton Reese, and Bradley Carpenter received the Life Saving Award for their efforts in saving the driver of an overturned truck engulfed in flames. On October 13, 2018, deputies responded to reports of a rollover crash on McIntosh Road. When Deputy Carpenter arrived on scene, he attempted to extinguish the fire to no avail. Deputies Conly and Reese began dousing the flames while Deputy Carpenter and Sergeant Flint tried to reach the driver who was the only occupant of the vehicle. After breaking several windows, Deputy Carpenter and Sergeant Flint pulled the driver to safety and administered first aid until the Sarasota County Fire Department arrived and transported the driver to Sarasota Memorial Hospital. Sergeant Flint, Deputy Conly, Deputy Carpenter, and Deputy Reese exhibited extraordinary merit and dedication to duty in this successful attempt to save the life of a citizen. Deputies Kevin Macnicol and Joseph Bowers received the Life Saving Award for their efforts in bringing a man back to life after he experienced a heroin overdose. On November 2, 2018, Deputy Bowers was first to arrive on scene where he found the patient unresponsive on the bathroom floor and began CPR. Deputy Macnicol was next to arrive and immediately administered his agency-issued naloxone. The man soon regained consciousness before paramedics arrived and transported him to the hospital. Responding paramedics confirmed without the quick response of Deputy Bowers and Deputy Macnicol, the patient would not have likely survived. Thanks to their swift action, the patient now has a second chance at life. Deputies Michael Jackson, Gene Nault, and Daniel Ivanov are recognized with the Life Saving Award for their efforts in saving the life of an overdose patient. On November 16, 2018, deputies responded to a Sarasota home where they found a citizen performing CPR on the patient who was unconscious and not breathing. Deputy Jackson quickly began life-saving efforts as Deputy Nault arrived and deployed naloxone twice without success. Deputy Ivanov was third on scene and immediately administered a third naloxone injection while Deputies Jackson and Nault continued CPR. Within moments of the third dose, the man began to breathe and became responsive. The victim stabilized as paramedics arrived and was transported to the hospital where he made a full recovery. Personnel from the Sarasota County Fire Department and Doctors Hospital confirmed the actions of Deputy Jackson, Deputy Nault, and Deputy Ivanov saved the man’s life. Deputy Steven Klinge received the Life Saving Award for his response to a rollover crash on I-75. On September 30, 2018, Deputy Klinge arrived at mile marker 195 in the northbound lanes of the interstate, where he found a woman inside a vehicle badly injured and bleeding heavily from her arm. Deputy Klinge quickly retrieved his first aid kit and applied a tourniquet to the woman’s arm. Paramedics soon arrived and continued treatment of the woman’s injuries before she was air-lifted to the hospital. It is thanks to Deputy Klinge’s quick actions the victim survived. Corrections Sergeants Joseph Mitchell, Scott Kinney, and Adam Sherman, along with Corrections Deputies Timothy Major and Kurtiss Manley, and Administrative Assistant II Mary Lang were presented with the Meritorious Achievement Award. These six members are recognized for their tireless work to design and build a new employee wellness center in the Sarasota County Jail. Once tasked with the project, deputies began preparing the space for the new gym, which required electrical, plumbing, painting, and floor work. The project also required renovating office space into locker rooms and installing swipe card access points. Much of the work was completed directly by these members to stay on schedule and keep costs down. Members were able to complete this project on time, with the gym opening on October 1st, all while balancing their normal job responsibilities. These dedicated employees went above and beyond to ensure the new employee wellness center opened on time. The finished product received much praise and is a valuable accomplishment towards the well-being of all Sheriff’s Office employees.